Bras with Flair & Official Decorating Party – Event Details Released! Ahh! I can’t believe it! It’s already time to promote our longest running event, Bras with Flair on the Square! It’s going to be our NINTH annual event this year, and I’m really pumped about it. We’re working with Owl Be Sweatin’ to promote their new Strength Series of headbands, where a portion of the proceeds benefits a local breast cancer survivor… who will be making an appearance in our fashion show! Also new this year is an Official Decorating Party, which we’re going to hold at A Village Gift Shop in Glendale on Sept. 17. If you attend and decorate your bra at the party, you’ll get free tickets to Bras with Flair! Plus, you’ll get to enjoy refreshments, food truck yumminess, shopping and lots of fun! All the event details are below! Hope to see you there! You can see this and more than FOUR HUNDRED (yes, that’s how many donations we got in!!!) decorated bras flying high on Fountain Square on Oct. 19. Click here for more details and to RSVP for the Bras with Flair Fashion Show that benefits Susan G. Komen! Below another pic of a bra that you can see flying high on Fountain Square Oct. 19… my friend Jenny at LadyLike Chic created this one. She says she was going for a dark, French coquettish vibe. So she took a black bra, covered it in purple lace, and added a few bows, pearls and some black ruffles to the bottom of the bra. So chic! I love it! Hope to see YOUR bra on Fountain Square too! Like I said before, Friday is the deadline for drop-offs. Then, we’ll have them all displayed on Fountain Square from 11am-1pm, and we’ll also be taking votes for everyone’s favorite creations. The top vote earner wins two Ultimate Jet Charter Tickets! If you’re in the top 10, the bra is paired w a silent auction item and given to the winning bidder. Others will be sold for a donation to Susan G. Komen! Bras with Flair Donations Due This Week! I stopped in to PNC Bank to see how our Bras with Flair on the Square decorated bra donations are coming, and a ton of incredible creations have been submitted! Here’s one from DiscoToes (we recently wrote about them here in Cincy Chic!). 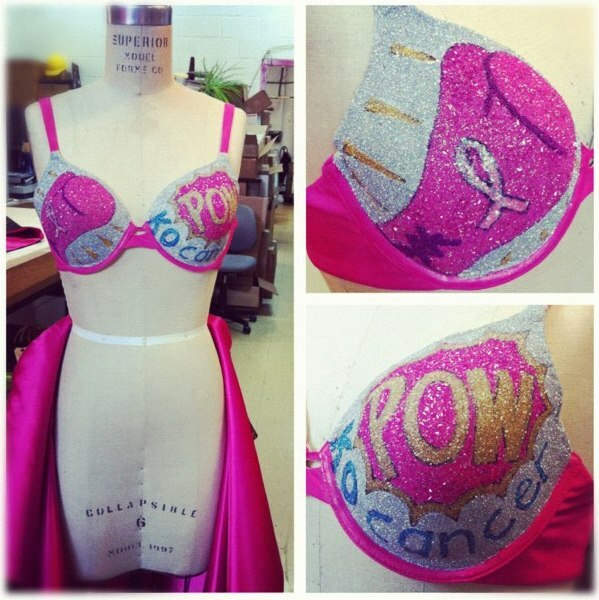 This Friday is the last day to donate your decorated bra, so don’t miss out! Drop-off details and prize info here: http://cincychic.com/braswithflair Then, see all the decorated bras fly high on Fountain Square for the big event on Oct. 19. Click here to learn more and RSVP! Well… not literally parading in public… more like flapping in the wind. That’s right! Today is the big day for Bras with Flair on the Square! From 11am-1pm, vote on your favorite bras (the top 10 will be auctioned off at the end) while grabbing some homemade lasagna from Gabby’s Cafe (portion of proceeds go to Komen!). From 5-7pm, there will be a Ta-Ta-tini happy hour. 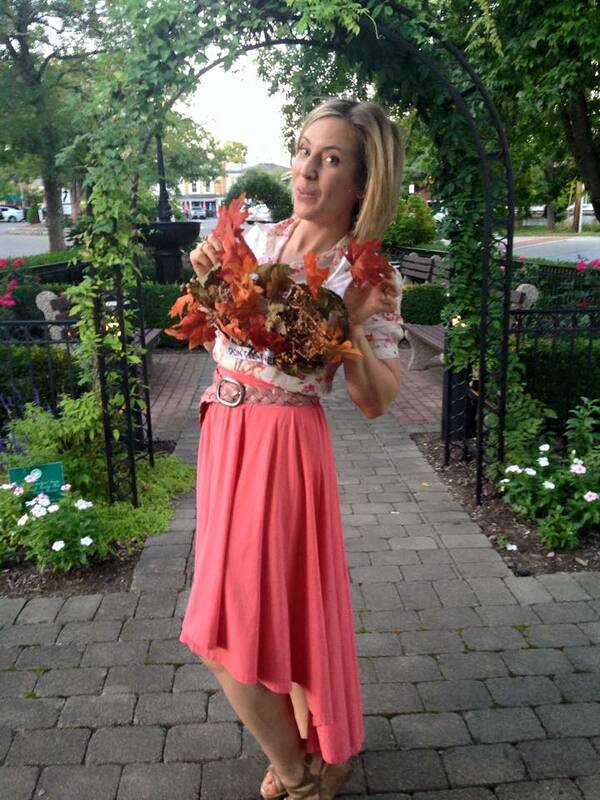 At 7pm, enjoy a fashion show featuring designs from ALK Fashion. The winner of Cincinnati.Com’s and Cincy Chic’s Breast Cancer Survivor makeover will be honored at the end of the fashion show and she will walk the runway to showcase her makeover and new jewelry from Serket Jewelry. If you’d like to come to the show, click here to buy your ticket. It’s only $15 and it includes a reusable tote bag stuffed with swag… plus 100% of the proceeds go to Susan G. Komen! After the show, head down to the after-party at Tonic on Fourth where the 10 favorite bras, determined by public voting at the event, will be auctioned off in a silent auction. All proceeds from the auction and fashion show tickets will go to Susan G. Komen for the Cure. We’ve been promoting this fourth annual event for months now, so I’m very excited to make it happen today! Click on the play button below to see some news coverage I did last weekend on WLWT about today! Hope to see you down on the square to vote, shop, sip on a ta-ta-tini, or see the fashion show… or, all of the above!